Data integrity and ultra-high performance dictate the success and growth of many companies. One of these companies is BridgePay Network Solutions, a recently launched and rapidly growing financial services organization that allows merchants around the world to process millions of daily credit card transactions. Due to the nature of their business, their IT team needed to strike the perfect balance between meeting regulatory-mandated data security measures with the lowest possible levels of latency and response times. As their growth accelerated, BridgePay realized the need to immediately address infrastructure shortcomings and prepare for their future growth. 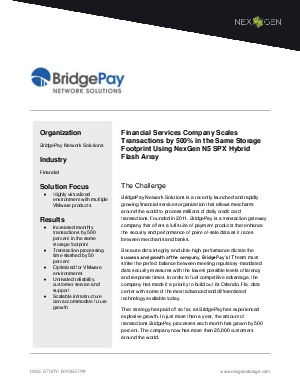 Download the case study now and see how BridgePay built a competitive advantage and scaled transactions by 500% in the same storage footprint using some of the most advanced and differentiated technology available today.